I love this song (Anol Shalom meaning Now We Are Free) by Lisa Gerrard. Interestingly, I found this video on YouTube a little over an hour after posting a magically related entry on Craftwork - Secure Boundaries Of The Universe - about the newest curio added to my cabinet of magic. Read about the mystical geometry of circlecasting garnet granules at Craftwork Of A Jewitch. ~I will go in the name of God, in the likeness of deer, in likeness of horse, in likeness of serpent, in likeness of King. More victorious am I than all others. A 9.5-foot boa constrictor slithers into a yard in Orlando and eats a family pet. WFTV reports. Just documenting another psi-synchronicity. The snake in the news report ate a housecat. In my dream, the house cat walked through the unified void (י) filled with a language of song (ט) unscathed. Even a single hair of the cat that had been caught up in the unified void was released from the snake-like "quantum tunnel" of the void and not eaten. The "distinct individual otherness" of the house cat was maintained and not consumed in my dream. This is very good. It points to the power of Unity without Self-Obliteration and without Obliteration of the Other. I had a baby girl somewhere down the (family) line. Her birth name is Gwenn. Gwenn is a Welsh name meaning blessed. An inner name within her birth name is Susy (סוסי literally means 'my horse' and mystically means to actively project the Creative Evolutionary Power of the Infinite into the finite). I nursed her in the dark. Susy has a talent no other human child has - she can dematerialize and rematerialize to teletransport herself from place to place in spacetime like on Star Trek. Only, unlike Star Trek, Susy doesn't need a transporter machine. She can actualize it naturally, at will. In the dream, Susy teletransported herself between points in the living room, rematerializing against the surface of my right leg. 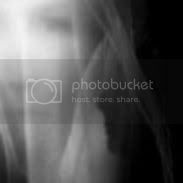 As she did this, I heard Susy in conversation with unheard unseen spiritual beings neither I nor anyone else in the room could see or hear. The language Susy spoke in simple song was Divine, primordial, pristine, exquisitely complex, complete and unknown in the known world. While in my body in the dream I could not understand the Divine words Susy spoke, I intimately recognized the Divine language with which she sang - for I had once clearly spoken it too. I remembered speaking it - I knew it though I didn't understand it in the dream - it was the language I had spoken before I was born, as I was incarnating, in the womb and during the early post-natal period of life. It is also the language of the epiphany, a language of the Witch Ancient of Days. My family was in the living room as Susy was teleporting from one point in the room into the space beside my right leg, and I said to them, "She is communicating in an ancient Divine language to me - remember when I told you about before I was born and that I did this once? Gwenn is doing it too." Gwenn is my granddaughter, my daughter's daughter. We are children of the Divine Feminine Essence. This is an example of Traditional Witchcraft and Torah Nistar. 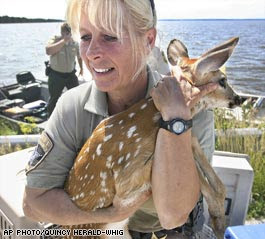 Photo just posted on the frontpage at CNN online, captioned "A fawn is rescued from Illinois floodwaters (AP)". The morning star of one day's evening. The transition metal with which my newest ritual treasure is made is cobalt. With an atomic number of 27, most of the earth's cobalt is in its core. The Hebrew word for cobalt is ערב meaning 'evening'. My Craftwork cobalt 'evening'-related entry follows yesterday's series of 'morning'-related entries which began with Death Of Distortion, The Day The Sun Stood Still. During the period of time uniting the entries this weekend, as the order in my writings, evening followed morning. The morning to evening order is the reverse (a function of vav hahipuch) of that with which the waters of Bereshit 1:5-6 were divided, suggesting that the waters of Creation are no longer divided, and have reunited (a function of vav hachibur). NASA's Phoenix spacecraft could soon find out. Since plopping down near the Martian north pole a month ago, the three-legged lander has been busy poking its long arm into the sticky soil and collecting scoopfuls to bake in a test oven and peer at under a microscope. "We are looking for the basic ingredients that would allow life to prosper in this environment," chief scientist Peter Smith of the University of Arizona in Tucson has said in describing the mission's goal. The discovery of extreme life forms, known as extremophiles, in unexpected nooks and crannies of the Earth in recent years has helped inform scientists in their search for extraterrestrial life. Extremophiles are important to the scientific field of astrobiology (which concerns study of the origin, evolution and future of life in the Universe). The news article is synchronous with this morning's first Craftwork post (Rare Treasure, Soul Dance) referencing the evolutionary dance of the soul. I think we are on the verge of an evolutionary jump in consciousness. SACRAMENTO, Calif. — Wildfires were scattered around Northern California on Sunday, many of them started by lightning, as crews farther south were close to containing a blaze that had forced thousands to evacuate. The fire threatened 66 homes and two commercial properties as it burned in grassy woodland about 40 miles southeast of Sacramento, said Wayne Connor, a spokesman for the California Department of Forestry and Fire Protection, or Cal Fire. Other fires were scattered throughout Northern California, with 90 ranging up to 125 acres in the Mendocino County area alone, said officials of the California Department of Forestry and Fire Protection. Gov. Arnold Schwarzenegger's office said Saturday that lightning had sparked nearly 400 fires from Monterey County to the California-Oregon line. The governor ordered the California National Guard to assist in firefighting efforts. Read the full news article at link above. From midwestern flood waters to California's 400 wildfires sparked by light, nature is bouncing with extremes. In follow-up to today's earlier Sabbat/Shabbat entries (Death Of Distortion, The Day The Sun Stood Still and HaMiklat, The Staff & The Star), I sit here listening to the mystically magical music of my CD The Light Of Midnight and ponder the mystery of Giv'on. Solomon stopped short of the full prize with his request. To discern between good and evil is not enough, when within the heart of darkness is a magnificent light waiting to be redeemed. Toward recovering that pristine brilliance pulsing within the soul of Holy Darkness, Walking On Fire aspires. Today's earlier morning star divination took place with the waning gibbous moon 92% full. Interestingly, my magic staff (מכתם לדת) was ritually stained last month with the waxing gibbous moon also 92% full. The number 92 is associated with the number of naturally occurring chemical elements found in nature and with the number of distinct Hebrew roots found in the Torah story of creation. The combined gematria of the double-portioned "92" is 184 - the gematria of המקלט (HaMiklat, messianic miklat miklat in singular unity). In addition to the doubled 92-connection, today's morning star entry and the staff entry from a month ago each contained a concluding Ogham letter divination which consisted of the fid Saille. The letter Saille, among its correspondences, associates with the concept of female moon tides. The star divination took place on the waning moon tide. The staff divination took place on the waxing moon tide. The staff and the star divinations are therefore intimately interwoven with the wax and wane of the Divine Feminine energy as She weaves the double-knotted rhythm of nature singing with the messianic lifeforce of the staff and the star. Sabbat/Shabbat divination, with the waning gibbous moon 92% full, during the planetary hour of Mercury and during my morning observance of Litha (the day the sun stands still). Taken together, this divination brings out Divine Prophetic Power, sensitivity, discernment, judgment and intuitive understanding into the nature of the comprehensive root of distorted consciousness, to rectify (deal death to and transform) all distorting distortions (both revealed and hidden) at their common source. Lori A. Lappin, R.N., B.S. Seeking a professional business-oriented opportunity in clinical reimbursement data management. • Turn-Around Accomplishment - Increased facility CMI 16.2% since May 2007, reversing a 2-year downward trend prior to my employment. • 100% records supported on EDS audit. • Current CMI 17.3% above Indiana state average CMI. • Current CMI 13.1% above facility CMI goal. • Current CMI 12.1% above company-wide average CMI. • Received 10% salary increase at yearly performance appraisal. • Attended 2-day 2008 Case Mix Workshop sponsored by Myers & Stauffer. • Attended MDS Workshop sponsored by the Indiana State Department of Health. • Created company MDS orientation and training manual for new MDS Coordinators. • Created training material for guideline instruction of MDS Coordinators and Directors of Nursing regarding skilling nursing home residents for Medicare. Current license in good standing as a Registered Professional Nurse in Illinois and Indiana. Reports of historic floods in the midwest have filled the news this entire week. Foxnews reports tonight that 38,000 people in 26 Iowa communities have been evacuated from their homes along the Mississippi River. All of this week's watery news follows my Tzohar dream 9 days ago (Friday night, June 6), where we were in an enclosed room rapidly filling with water and in danger of drowning unless I "could really do magic and get us out". We got out in my dream and did not drown, but it seems that Iowa and various other places in the midwest may have become inundated (in consequence to our successful escape? I'm not sure how these psi things work). Also today, Foxnews reports on a teenage girl who survived a lightning strike which connected to her through touching to close an open window - this news event also has synchronicities with my Tzohar dream/vision, where light was coming into alignment with a "window". The lightning strike incident, though reported online by Foxnews for the first time today, occurred on June 6. While some may believe that my new car Lily was named after Lilith, she was actually named after Lily Munster, the strong-willed and wickedly intellectual matriarch of the Munster household. Well, I finally did it. I let loose of some significant cash and bought a car with working air conditioning. It's not a brand new car, but it is of a recent year in like new condition. I named my new vehicle Lily. Lily is a 2004 Grand Prix GT with an all jet black exterior, a dark grey leather custom interior, and a high performance 3800 Series III V6 engine. She is fully loaded with many luxury options - her magnificient engine can be started from inside the house. Her seats, with adjustable lumbar support, can be heated in the winter time. She has a sunroof and a satellite receiver antenna too. At first, I looked at a newer, more economical Ford Focus, but I fell in love with Lily. Lily is an exquisite merkavah. She absolutely purrs. More links to my Tzohar dream - a real life event and another headline news event. First in real life, a neighbor who is also my uncle (my father's sister's husband), called yesterday morning and reported that he and my aunt had seen a snake about 4-5 feet long on our shared driveway. By the time he had gotten a tool to go 'take care of it', he couldn't find the snake. It had disappeared. My uncle wanted us to be careful if we went outside in the yard because last time they had seen the snake, it had been on the driveway heading in the direction of our house. The snake was never found, nature had swallowed it up for me. I never saw it anywhere. As far as I was concerned, it had returned to nothingness. Thus, like in my dream, there 'may have been a serpent with us', yet then it was not. My uncle remarked later, that the reptile had probably been just a "friendly neighborhood snake". When her daughter Isabella awoke in the middle of the night, Cari Abatemarco probably thought the infant needed a bottle or a diaper change, but the New York woman was instead shocked to find a snake in the 7-month-old's crib, Newsday reported Tuesday. Abatemarco of Troy, N.Y., says she was visiting family on Long Island, in Brentwood, last week when she discovered the snake coiled around Isabella's leg. The mother told Newsday that she lifted her daughter out of the crib and the snake fell off. Her uncle then used a back-scratcher to lift the hissing snake and place it in a bucket until animal control officers arrived. "Once I lifted her up and the snake fell off of her, she stopped crying," Abatemarco said. "But then I was the one crying all night." The reptile has been identified as a 1-foot-long California king. While non-venomous, it is still a constrictor commonly kept as a pet. In the City of David. Scandalous. Dig at your own risk. Last evening's motzi shabbat divination consisted of 3 Hebrew letters and 1 Ogham letter. It is not in the heavens, that I should say, who can go up and get it for me that I may observe it. Another news link to my Tzohar dream last night. LONDON, England (CNN) -- A neighborhood in east London was getting back to normal Saturday after British Army engineers detonated a large World War II bomb unearthed this week on a building site, officials said. An Army bomb disposal team carried out a controlled explosion on the 2,200-pound German warhead at 5:55 p.m. (12:55 p.m. ET) Friday, London's Metropolitan Police said. Video of the blast showed brown dirt, debris and black smoke shooting into the air when the bomb went off. There were no reports of any injuries or damage to surrounding property after the blast, the police and Ministry of Defense said. The bomb was "enormous," said Simon Saunders, a spokesman for the British Army's London district. At one point during the week the bomb started ticking, which suggested a timing device, Saunders said. Disposal experts put strong magnets next to the bomb to shut down the clockwork and the ticking stopped, he said. It's not uncommon for World War II-era bombs to be unearthed in Europe. In London, which suffered the aerial bombardment of the Blitz, bombs are uncovered two or three times a year, Saunders said. The London Blitz lasted from September 1940 until May 1941. German bombers attacked the city every day or night for the first two months, but the worst night was the last -- May 10, 1941, when 3,000 people were killed in London, according to the Museum of London. Read the entire news article at link above. Most of my European ancestry is of British-Welsh-Jewish origin, with some Celtic-Irish and Germanic ancestry as well. The "bomb" of my dream therefore, seems to represent that single original aspect of the psyche which corresponds to a Mordechai-Haman like bifurcation. In my dream, the single unified Mordechai-Haman aspect corresponds to the single line on a woman that is dangerous for a man to 'read directly'. Setting off the bomb (like in my dream) corresponds to setting into motion supernal actions which will culiminate in one of two potential realities finding entrance into manifestation. In other words, the bomb will cause to manifest and raise up life (Mordechai) or to bring out hidden fascist tendencies which lead to death (Haman). This is why it is dangerous for a man to read the line of a woman directly - it will bring out this bifurcation within a man, to raise up his life or to bring about his death. 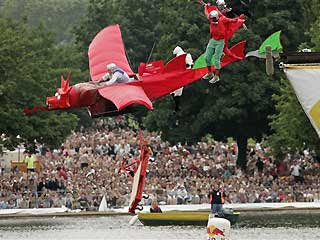 Wings made out of cardboard, parts attached with chicken wire – these are some of the features of the gimmicky ‘flying machines’ that will take off from a 20-foot ramp and then plunge into the chilly waters of the Serpentine in Hyde Park, London, on Saturday. Red Bull’s “Flugtag 2008” is a competition in which home inventors “fly” their machines as far as they can off the starting ramp, while winning points for style, in an homage to the pioneers of aviation, the Daily Telegraph reported. But no matter how far they go, all will eventually meet a cold, watery end. Flugtag, which means “flying day” in Austrian, is all about constructing flying machines that plummet to the water within yards of take-off, the Telegraph reported. Alex Raffle, the mastermind behind one of the competing machines, said his design changed over time. Photo is of one of the flying machines headed for the Serpentine today. It flies for a day to live forever. JAKARTA, Indonesia (CNN) -- Five Europeans rescued Saturday after an Indonesia diving trip went wrong had to fight off a Komodo dragon while they were waiting to be found, according to reports. The group was found at Mantaolan, which is on the island of Rinca off the Komodo National Park, after going missing on Thursday. The divers -- three Britons, a Frenchman and a Swede -- spent two nights on the deserted island which is home to the large Komodo dragon before rangers found them Saturday. Frenchman Laurent Pinel, 31, said the group had to fight off one dragon with rocks and scavenged for shellfish as they waited to be rescued. The husband of one of the other divers said he was told they were in good condition, although dehydrated. "I'm just so relieved," said Mats Kohler, whose wife is Helena Neva Lainen. Searchers using boats located the missing divers at 11 a.m. Saturday (11 p.m. ET Friday), the official said. They were one of two groups of divers who entered the water off Komodo National Park Thursday and were supposed to be gone for an hour, said an employee of the dive company, Reef Seekers. The second group came back after the hour passed but the first group failed to resurface, she said. The seas that the divers were in are known to be dangerous because of their strong tides, and that's one theory being investigated in the divers' disappearance, the employee said. The bomb went off, destroying the mountain of time. We were all thrown through time into a huge enclosed room rapidly filling with water. A serpent may have also been in the water with us. We would all drown in the room if I couldn't really do magic and get us out. How reptilian the battle which delivers us to life with the iron framed sunrise. Foxnews reports that the five divers were found 36 hours after disappearing. WASHINGTON (AP) -- The actress who played Wonder Woman on TV in the 1970s says she didn't do anything extraordinary when she discovered a body this week on the Potomac River in Washington. Lynda Carter tells The Washington Post she was alone in a boat when she saw the body Wednesday. She says she didn't have a cell phone with her, so she yelled to some fishermen and asked them to call police. District of Columbia police say the body of 47-year-old Helen Johnstone of Washington was found floating on the river Wednesday. Read the full news report at link above. The woman upon whose back my timelines were being read didn't like this news the reader was providing to the man. I felt the woman whose back was being read was a rival of some sort. She didn't want the timelines on her back to lead to me and refused to let the woman reader read my timelines any further. The woman upon whose back my timelines had been read, got up and informed the man that he would have to read the single timeline directly on me if he wanted any more information. In other words, she wasn't going to give up her place in the running of potentials and concede victory to me so easily. She got up and walked away from the reading place. Foxnews reports that 47 year old Helen Johnstone was found floating face down. In my dream, I was brought up from the river face up by two corpses whose faces were also face up. I dreamt. These are the details I can clearly remember, which begin somewhere in the middle of the dream. The beginning of the dream has since faded beyond discrete memory. There was a mountain. I and two other women were in a room within the mountain. A man was there with us. He and his father were doing and had been doing experiments over time with time. They kept trying to stay one step ahead of time "catching up" to their whereabouts in any particular time, because if it did before they "fixed it", all creation would be annihilated. The man and his father had set up a nuclear-like bomb to go off deep within the mountain, which would destroy the mountain built of time. We would be killed or forced into another time. That is, those of us who were eternal would be forced into another time. Real, manifest time. The man and his father knew each of them were eternal, but wasn't sure about we three women in the mountain's room. We would either be destroyed in time when the bomb went off or, if we were also eternal, we would jump through time with the man and his father. Suddenly, we were in a gypsy camp. A woman was reading my timelines off lines on each side of the spine appearing on another woman's back. The man was employing the woman to read my timelines on the other woman's back to see if my timelines were related to his. He was doing this because, on my back, my 'timelines' existed as a single timeline directly over the spine. For some reason, the one timeline on my back could not be easily read directly and had to be read as two timelines on the other woman's back. It was dangerous and would be lethal for a man to read the single timeline of a woman whose timeline was not directly connected to his. The woman reader's words as she spoke to the man regarding my timelines were increasingly suggesting to the man that I was the one whose timeline was connected to his throughout all time. The woman upon whose back my timelines were being read didn't like this news the reader was providing to the man. I felt the woman whose back was being read was a rival of some sort. She didn't want the timelines on her back to lead to me and refused to let the woman reader read my timelines any further. The woman upon whose back my timelines had been read, got up and informed the man that he would have to read the single timeline directly on me if he wanted any more information. In other words, she wasn't going to give up her place in the running of potentials and concede victory to me so easily. She got up and walked away from the reading place. The man had no choice but to try and read my single timeline directly from me if he wanted to ascertain surely the connection of our timeline. He decided to try. The door opened and the rafthouse became more raftlike. A man stood upon its surface deck with a wooden staff like a ferryman. He saw the two corpses with the four copper pennies over their eyes. Then, he accepted me and plucked me up with his staff out of the water and pulled me onto the raft where I rested. Suddenly, an iron framework came down from above or rose up from below around we two on the wooden raft. The iron framework consisted of four equally spaced iron poles turning inward and upward toward an iron circle zenith to which they connected. It was the framework of a temple room. The circle was open at the top like a paneless window, a tzohar. The four iron poles came out from the outer surface of the circle window. Its broad dome-like form reminded me of the temple of Newgrange. I was laying upon the surface of the wooden raft looking up through the iron encircled window above me into the moving grey sky. I woke up, laying in my bed. Yet, the visions of my dream continued. Even as I listened to the thunder outside, I saw tattered storm-cut video tape flapping in the wind off the wooden joints of the raft upon which I was laying. It reminded me of the video tape used to make the wooden raft in the film Cast Away, which I had watched last night. Near the end of the film, as the man is about to be rescued at sea, there is a scene of the man laying on his wooden raft after a storm with a brief scan of the battered and storm tossed raft still being held together by tattered video tape. Suddenly, I saw an alignment coming and looked up toward the iron circle above me. The sun was moving into alignment with the circle's opening over me. The sun moved left to right into perfect alignment within the circle. The sun perfectly fit into the frame of the circle from which its light focused down. Exactly onto me. It reminded me of הנץ החמה. The waking vision ended. I got up and recorded it. Laurent-Lori, Lapid-Lappin. Not exactly Lori Lappin and her magical mezuzah. Two news articles today - both gentlemen passed over today, Lapid this morning, Laurent this evening. PARIS — Legendary designer Yves Saint Laurent, who reworked the rules of fashion by putting women into elegant pantsuits that came to define how modern women dressed, died Sunday evening, a longtime friend and associate said. He was 71. Pierre Berge said Saint Laurent died at his Paris home following a long illness. Yosef "Tommy" Lapid, a former justice minister and one of Israel's most influential journalists, succumbed to cancer around 5 a.m. on Sunday morning at Ichilov Hospital in Tel Aviv. He was 76. UNIVERSAL CITY, Calif. — A massive blaze that broke out on a lot at Universal Studios early Sunday destroyed the "Back to the Future" set, the King Kong exhibit and a video vault. Los Angeles fire chief Michael Freeman said over 400 city and county firefighters were mobilized to battle the fire, which broke out at around 4:30 Sunday morning on a sound stage on a back lot. "The fire moved through the area extremely fast," Freeman said. The damage included the backlot area, known as New York Street, Court House Square —which was a set for the film "Back to the Future" — and the King Kong exhibit. Also destroyed was a video vault located behind the street facades, Freeman said. Thick columns of smoke have been seen rising thousands of feet into the air, and one person described the scene as "looking like a bomb had exploded in the San Fernando Valley." Freeman said the black smoke is a result of plastic video containers burning in the vault, which firefighters worked to save. “They moved hundreds of containers out of that structure,” he said. Ron Meyer, President and Chief Operating Officer at Universal Studios, said that between 40,000 to 50,000 videos and reels were in the video vault, but there are duplicates stored in a different location. Interestingly, the Universal Studios fire broke out on a sound stage. We saw here that sound was a central point connecting seemingly unconnected events this past Shabbat (Celtics Polish Off Pistons and Her Sound In The Garden), a time when thunder and lightning and dense clouds rolled across the midwest. In other words, we saw the sound connection this past Shabbat, and we continue to see the sound connection today in this magical-mystical synesthesia. Well, it is close to Shavuot after all. There are 3 names of Shavuot. The fire at Universal Studios was a 3-alarm fire. If you see nothing diabolical in witchcraft, then you obviously know nothing about its practices or its practitioners. This is what real witchcraft is about: the casting of spells in an attempt to manipulate the minds and feelings of others, the sacrifices of animals, the ripping out their organs and the drinking of their blood, the invocation of demons, and other dangerous mind altering psychological practices. Witchcraft goes under various names today to disguise itself. Under such names as Wicca and Goths, witchcraft and the likes are responsible for numerous teenage mental breakdowns, suicides, and murder. Unfortunately, we adults are enchanted by the surface delight of Harry Potter and we do not pay enough attention to what lies underneath. Parents will not foresee the inherent danger to their children while they are still young. While they are young, messages like those in Harry Potter merely plant the seeds of delight in witchcraft. Once the children become teenagers, they have the ability to use their local libraries and the Internet to find out about real witchcraft. Granted, not every student of witchcraft becomes a cold-blooded murderer or commits suicide. Nonetheless, we already have so many examples of those who did. All these poor unfortunate souls shared one common trait: their passionate pursuit of witchcraft led them to the darkest sides of human behavior. Thank goddess! people can use their local libraries and the internet to find out about real witchcraft and not blindly accept this kind of drivel about it. Harry Potter magically transforms a dark part of human life and makes it so appealing. A spark of truth. Build on that idea rabbi. This is why I find the Harry Potter phenomenon so dangerous. That's why I find it so Divine. To understand, as least on a basic level, why it appears that G-d is smiting people because of their sofer’s mistakes, remember the principle “portion across from portion” (mida kenegid mida). Everything comes according to its measure and for a good reason. Certainly you know that there are no accidents in the world. We may not be able to always understand why any particular thing comes to us, but we do know that it all comes for a good reason. When something happens to your hand, (seemingly good or bad), you have to ask, “Why did this come to my hand?” In order to be able to understand why that happened to you, remember that it had to come because of something that you did with your hand, not with your foot, or any other part of your body. Otherwise, what hope would there be of ever being able to guide your life? G-d runs the world by the principle of mida keneged mida for this very reason—so we will be able to understand the consequences of our actions. The consequences must reflect the actions. Why did the man in our story choose that sofer (scribe)? Why did he get that particular mezuzah? All this came for a reason. To lose sight of this is to believe in a random, chaotic world with haphazard results flying down upon our heads. As far as “magically” changing the mezuzahs, remember the story of Elisha, Master of Wings (Shabbos 49a)? He was caught by the Romans wearing his tefillin when there was a life threatening ban against wearing them. He quickly took off the head piece of his tefillin and tried to conceal it in his cupped hands. When the Roman soldier, threatening his life, asked him what was in his hands, he said that it was a dove. The soldier forced him to open his hands, and sure enough there was a live dove there. Did G-d magically change his tefillin into a living bird? Surely He changed it into the bird, but not with magic. With a gematria of 358, tafsaret (טפסרט) is a rare type of sofer; tafsaret is a feminine scribal artisan described by a Hebrew word of Sumerian roots. From the language of ancient Sumer , sar means "write". Taf means "board". The Hebrew verb root סרט carries the meanings of "script", "a tool for designing" and "marking" . The letters of tafsaret contain the root (ספר) of the word sofer (scribe סופר). Yet tafsaret also contains two letters ט in addition to the root letters of ha-sofer. These two letters ט have a combined gematria of 18 (חי) - thereby bestowing "life" into the scribal writing of tafsaret. Specifically, the two additional letters of חי represent the chayah and yechidah soul levels which pertain to actualizing messianic consciousness. LOS ANGELES, California (CNN) -- A massive fire Sunday at Universal Studios destroyed the building housing the King Kong exhibit and damaged a video library vault, officials said. The fire is still burning at the video vault, Los Angeles Fire Chief Douglas Barry said. Firefighters have contained the blaze, but not extinguished it, officials said. Ron Meyer, the studio's president, said the motion picture vault was not affected. More than 400 Los Angeles-area firefighters are battling the fire in a backlot of Universal Studios, which is adjacent to the theme park. A plume of gray smoke clouded the skies above Universal Studios more than three hours after the fire broke out early Sunday. At least four or five structures were damaged or destroyed by the three-alarm blaze, a fire official told reporters on the scene. The blaze began around 4:45 a.m. PT (7:45 a.m. ET) Sunday. Two "prop" buildings, a chapel, and a popular ride called the "Cyclone" were among the damaged structures, according to Los Angeles County Fire Capt. Frank Reynoso. Television footage showed the fire burning through the roofs of structures and continuing to blaze hours later. "It will be awhile before we have it under control," Reynoso said. Read the full story at link above. Oops? I posted the first shamanic Judaism video twice (a double portion) the first time (correct now). The second video (part 3) is now available for viewing here or here or here. Take another look ... and hear more of the story.